Asheville Unreported: How did Asheville become so indebted? City of Asheville faces $100 million of unfunded capital improvement projects that are forced to be funded by municipal debt. Today's 5 year capital improvement plan is $149 million. Just 3 years ago it was $53 million. How did Asheville become so indebted? In the opening introduction of the City's fiscal year 2016 budget (which runs from July 1, 2016 through June 30, 2017), City Manager Gary Jackson writes "Capital investment needs, which could easily cost more than $400 million, continue to far exceed available resources" (page 5, City Budget FY16). Of this $400 million, $149 million is planned to occur within the next 5 years (FY 2016 through FY 2020). According to the City's adopted FY 2016 budget, "Approximately $110 million in funding will come from City resources through the issuance of municipal debt"
In order to prepare for this large unfunded capital investment balance, the City issued $46 million in limited obligation bonds last April 2016 which it plans to refinance into long term obligation bonds this year. We are still short $64 million. We ran an analysis of this year's City CIP budget and found that roughly 48% of the $110 million was going to be spent between this fiscal year (July 1, 2016 through June 30, 2017) and next fiscal year (July 1, 2017 through June 30, 2018). In other words, by this summer when we are all vacationing, we should be whole hog into spending $53 million of this unfunded $110 million Capital Improvement Program budget. Last year within 1 week of the FY 2016 budget passing, the $74 million bond referendum was announced to cover all kinds of capital improvement projects like greenways, sidewalks, a few crosswalks, some parks and buildings that were way overdue with what appears, about $10 million extra - just in case. The bonds passed on Election Day. The question becomes how did our capital improvement budget get so big that it required $46 million in bond obligations plus a $74 million bond referendum? 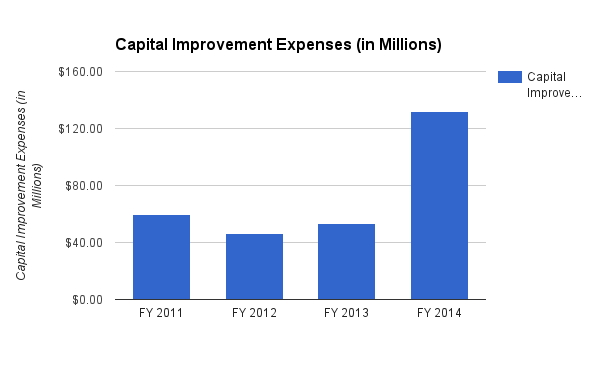 The FY 2011-2012 City budget for capital improvements was $59.45 million for the next 5 years. It required very little debt financing to operate it. Even so, that number was already 45% more than the previous 5 years. That number actually went down with the FY 2012 (July 1, 2012 through June 30, 2013) budget to a total of 46.5 million and back up to 53 million for FY 2013. Since FY 2014, the capital improvement program budget over 5 years has increased another $17 million to today's projected $149 million but the major increase occurred in 2014. Why the massive increase in 2014? Is it massive capital maintenance projects? Is it due to massive population increases? What projects are sucking up the most of the CIP budget? Is the tax burden and worth the benefit?